The debate over No Child Left Behind (NCLB) continues in New Jersey, this time over whether the state's new plan to meet federal education standards does enough to help the state's lowest performing schools. 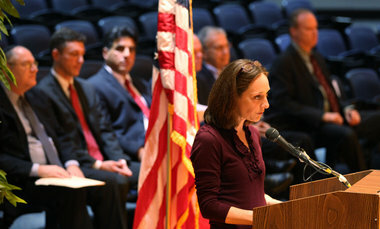 The Garden State has received a waiver from NCLB mandates, and a chance to come up with its own plan. In a letter to U.S. Secretary of Education, Arne Duncan, a number of advocates called on the federal government to suspend the NCLB waiver given to New Jersey. The signers of the letter sent a clear message to Secretary Duncan that New Jersey's plan of carrots and sticks is heavily weighted against minorities, stating "this classification system harks back to the days when such segregation and inequity were policy objectives for our State." In February of this year, New Jersey was one of ten states to be awarded a "waiver" from many of the mandates in the NCLB legislation. States were granted waivers in exchange for state level accountability based reforms focusing on the lowest performing schools. With the waiver in hand, the New Jersey Department of Education announced it would develop a system where standardized test scores and graduation rates were used to categorize schools into three groups, "Priority" "Focus" and "Reward." 75 Priority Schools were indentified as the "lowest-performing five percent of Title I schools across the state using proficiency, growth, and graduation rates." 183 Focus schools were identified "based upon achievement gaps between subgroups and low performance or graduation rates among particular subgroups." And finally, 122 Reward Schools were identified "based on high proficiency levels or high levels of growth, including progress toward closing achievement gaps." Regional Achievement Centers (RACs) have been set up all over the state, with some of the funding coming from private donors such as the Broad Foundation, to oversee and "turn around" the Priority and Focus Schools, and potentially take over the management of the schools that don't improve within the two year time limit. Professor Bruce Baker of the Rutgers University Graduate School of Education has mapped out the Priority, Focus and Reward schools. His work graphically demonstrates that the vast majority of Priority Schools are concentrated in New Jersey's largest, poorest, urban communities while Focus Schools tend to be in and around those communities. Reward Schools however are scattered throughout the states more affluent communities. New Jersey's plan relies almost exclusively on the same methods that failed to raise achievement under NCLB to "turn around" the 258 targeted schools that serve our state's most vulnerable students. NCLB, signed into law in 2002, has been widely criticized by prominent figures in education, even those who are on opposite sides of most education debates. Education historian Diane Ravitch, a vocal critic of what she calls the 'corporate reform movement', dubbed NCLB the "Death Star of American Education," while Secretary Duncan himself called NCLB "a slow-motion train wreck." If any subgroup in a school fails to make AYP for five years in a row, the school faces any of several forms of "restructuring" including conversion to a charter school, replacement of staff or closure. As 2014 approaches, rather than coming closer to the goal of 100% proficiency, more and more public schools are not meeting AYP. By 2011 48% of our nation's schools failed to do so, compared to 38% in 2010 and 33% in 2009. 50% of New Jersey schools didn't make AYP in 2011, but in Massachusetts, the state that boasts the top public school system in the country, 81% failed to do so. Education advocates across the state continue to add their names to the letter asking for the suspension of the NCLB waiver. They're signing because they understand that the system the state has adopted will inevitably result in the destruction of the public schools in our most vulnerable communities without offering any viable alternatives to improve outcomes for all students. Deborah Cornavaca and I have written a joint letter for Diane Ravitch's Campaign for Our Public Schools. Deborah is another tireless parent advocate who has dedicated herself to defending public education in our state. Diane's campaign provided the perfect opportunity for Deborah and me to let the President know how his administration's policies are effecting public schools in New Jersey. We invite you to join us in this campaign. If our letter resonates with you, comment below and I will be happy to add your name to the letter, or feel free to download it below and send it as your own. If you are feeling inspired, you can write a letter too! If you do, please share it in the comments below, or email it to me, (darciecimarusti@gmail.com) I would love to read it! I would also be happy to send it on for you, just let me know. write to your Senators and Congressman or -woman and to your state legislator and Governor. Send the same letter to them all. Full instructions for sending letters to the President are provided in the link above. You can find your state Senator and Assemblyman or -woman's contact information here. Governor Christie and your US Senator and Representative's contact information can be found here. Is Chris Cerf Picky Or Gun-Shy About Charters? John Mooney of NJ Spotlight reported on the two charters that were approved by Comissioner Chris Cerf and team on Monday. He said the fact that only two were approved demonstrates that "The Christie administration continues to be picky about new charter schools." I have read a NJDOE press release or two in my day, and the ones that come out about charter approvals tell a much different story. Here are some highlights from the last four press releases. January, 2011: Acting Commissioner Cerf had just been appointed; here is what he had to say about the announcement of the record 23 charter applications approved in that round. The record number of new charter schools approved today is a tangible example of Governor Christie’s commitment to bold and ambitious education reforms to put children first in New Jersey. Huh, OK, so lots of charter approvals = GOOD! September, 2011 This is the first round completely overseen by Acting Commissioner Cerf. Only four are approved, and there is lots of talk about the National Association of Charter School Authorizers working with the NJDOE to continue to "improve the application evaluation to align with national best practices"
This is the round where Regis Academy was approved in Cherry Hill, which as we now know was an unmitigated disaster for Cerf and Christie. The most important bar that any applicant must clear is demonstrating that the school has a very high likelihood of providing an excellent education to its students. Through our rigorous review process, we became confident that these four schools will offer students a great education on day one of the school year. Knowing what we know now about Regis, Cerf's "confidence" is down right comical. And huh, OK, now less charter approvals = GOOD! January 2012: Cerf is now firmly entrenched as Commissioner, he has a full year under his belt. This is the round where my community came down hard on Cerf and the NJDOE for their lack of transparency and accountability to districts, and the ELC and Senator Nia Gill came down hard on them for not releasing the names of the outside reviewers contracted to evaluate charter applications. The Department also receives and reviews significant public comment during this process. And at the end of the press release a list of the names of the reviewers appears for the first time. October 2012: This was the quietest application round in quite some time. No contentious debates about boutique charter schools in thriving districts, no protests at the NJDOE. There was however some opposition in Hoboken to an application which, if approved, would have continued to increase the segregative effect Hoboken charters already have on that district, but it didn't generate any state wide coverage. Only two schools were approved, one in Camden and one in Newark. (St.) Phillips Academy is the first private to charter conversion, and the International Academy of Camden, which Mooney describes as "an elementary school founded by a group of New Jersey entrepreneurs and likely to be run by a private education management organization." For now, let's get back to the press release. No list of the external reviewers and less talk about community input this time around. Without public pressure, the NJDOE goes back to business as usual. Instead they talk about "recruiting high-performing charter operators from across the country to expand into New Jersey." Read between the lines, and the implication is that if we bring in EMO's and CMO's we don't really need to bother with much review or community input at all, just let the professionals come in and set up shop. In the wake of Cerf's decision not to grant a final charter to Regis, along with nine other charters that had been in pipeline, we are treated to lengthy assurances that even though these applications have been approved they still need to obtain their final charter. In order for any of these schools to open, they must first complete a "preparedness review," to ensure they have the academic, operational components, and capacity to successfully meet the needs of children through a successful academic programs, financial viability, equitability, and organization soundness. After a review of the applicants' submission of this information in June of 2013, the Commissioner will render a final approval decision in July for charters to open their doors in September. What happened to the cocksure Cerf of 2011, who bragged that dozens of charter approvals signaled the Christie administrations "commitment to bold and ambitious education reforms to put children first" and his confidence in the application review process, led by NACSA, that ensured that approved applications were ready to provide a "great education on day one of the school year?" Ya know what happened? WE HAPPENED! We, the people of New Jersey. Parents, teachers, students, professors, education historians and even some of our fine legislators that support public education, and organizations like the Education Law Center and some of the fine folks that work there, like Stan Karp. We're all doing our best to let them know that we're paying attention and we're going to fight like hell before we let them dismantle our public schools. So now Cerf and his Office of Charter Schools are gun-shy. They're constantly changing their approach to dodge public pressure. The press releases show that we have them on the run. At a recent public meeting in Jersey City Commissioner Cerf said he doesn't read the blogs, but just in case. On school mornings my alarm goes off about 7:15 and my girls climb into bed with me for a quick snuggle before we get up and get going. I usually check my email as we lie in bed. I follow Diane Ravitch's blog, as I am sure many of you do, and get email notifications whenever she posts. I am often amazed at how late and/or how early she has posted, and wonder when this amazing woman sleeps! When I read the title of an email from 7:04 this morning my heart stopped. When I read that it was about me, I cried. Darcie Cimarusti is a hero of public education. As a parent of young children in the fine public schools of New Jersey, she became alarmed when a charter planned to open in her community. She knew that the charter would divide the community and undercut the public schools. This is her story. She joins the honor roll of heroes. She became an active crusader to defend public education in New Jersey. She has her own blog “Mother Crusader,” she writes letters to the editor, she testifies at hearings, she organizes other parents. She is a champion. With a mother crusader in every community, we could win the fight about big money. I read it to my girls, and they beamed. They may be the only 6 year olds in New Jersey who know Diane Ravitch by name. I have missed out on lots of time with my girls these last 18 months or so, and when I head off to a meeting or event, I try to tell them not only what I am doing but why I am doing it. Last May I had the opportunity to sit on a panel with Diane after a lecture she gave in New Brunswick. When I left to go to the event I told them how excited I was to be on the panel with Diane, and all about who she is and what she does. Diane comes up often in our house, yet still, my girls can't seem to get her name right. They call her Diane Radish. When I got involved in my town's battle against an unwanted charter, the fight was well underway. People in our community were meeting, planning, and strategizing, but I noticed that similar conversations were happening not only across the state, but across the country. I dove head first into those state and national conversations, and in the end, I think that perspective is what galvanized our opposition. It gave us a strength in numbers we did not have before. I have heard Diane say that they have money but we have numbers. She's right. It is the power in those numbers that saved my town from an unwanted charter school backed by a hedge fund demi billionaire and the United Stated Department of Education. Diane not only gives all of us the chance to get our voices heard, but to come together and gain the wisdom and courage to go out and make sure the schools our students and children rely on are not completely dismantled by profiteers and privatizers. Were it not for her (and Jersey Jazzman too) there would be no me. At least no Mother Crusader me. And for that, my girls and I thank you Dr. Radish.